There's no Samsung Galaxy Note 7 rumor more eye-opening than its purported iris scanner. Evidence of its existence have mounted in the past few weeks, and now, we're finding out even more about it. An article from TechTastic provides a few new and interesting details about the tech that's set to debut in the Note 7. First off, let's start with the obvious: the iris scanner won't be able to verify your identity if the phone's too close. According to product documentation, holding the phone any closer than 20cm away from your eyes will result likely result in an error. The sweet spot for iris recognition is between 25-35cm. The phone also seems to give a warning that the iris scanning feature may not work on people who wear glasses, or those with contact lenses when used in a low-light environment. Disappointing as that may be for those who can't see without them, it's just a rumor for now. This will surely be something we test in the full review. And before you get any wise ideas, Samsung also notes that the iris scanning tech won't work on babies. Potentially bigger news from this latest batch of rumors concerns the Note 7's RAM count. Just about each and every source so far has pointed to 6GB RAM as the amount that will come stocked inside. Even we were almost certain that it would contain this much, which would put it up there with the OnePlus 3. However, a screen grab shows that Samsung's next S-Pen-packed phone will only have 4GB RAM. Sure, 4GB is enough to provide a smooth experience, though it's obviously less than everyone has been expecting. 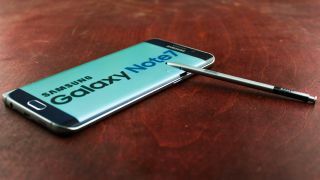 That said, things could change yet as we still have some time before the official announcement of the Samsung Galaxy Note 7 on August 2.